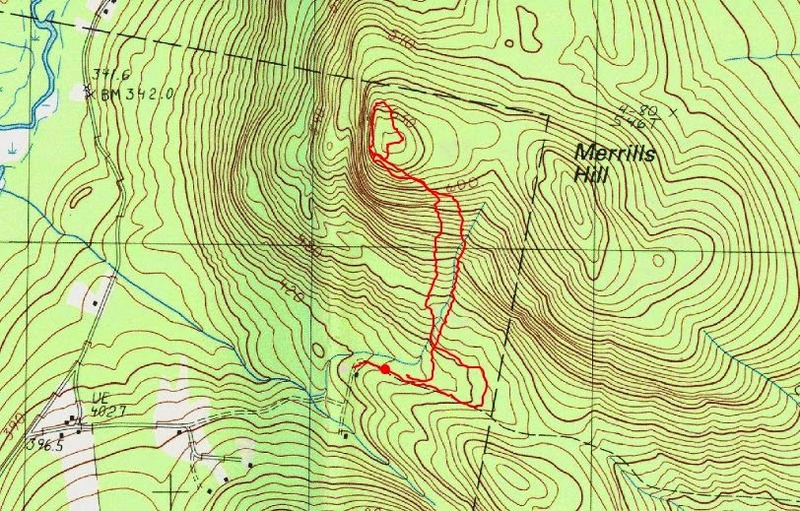 Every time I see a hill or a mountain with some open rock at or near the summit, I look on my map to see if the location is on public land and if it is accessible from the road. I've climbed quite few peaks this way. Many of these are unfamiliar to most people. On this particular Friday night occasion, I ventured up Merrills Hill in the Town of Schroon Lake. A rocky summit can be seen from Trout Brook Road. If you turn off Trout Brook Road onto Wamsley Road, and just keep going straight (ignoring the right turn onto Nurse's Road) the road turns to gravel, but you'll soon get to a dead end. 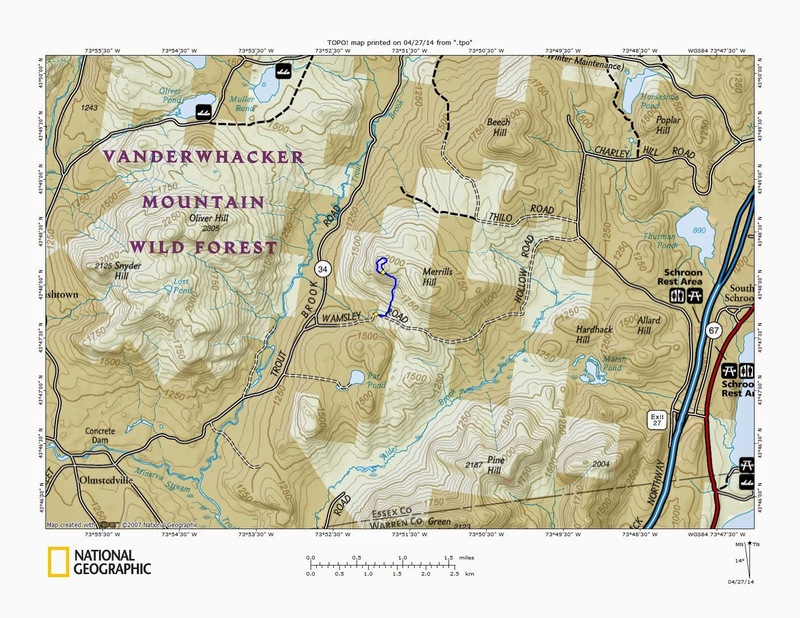 There is a small camp on the right. Beyond the dead end is an abandoned road which can be followed for a couple hundred yards before you come to state land. I continued to follow the abandoned road for a very short while and then turned left to pick up the drainage that leads up to a col just east of the summit of Merrills Hill. I crossed some orange flagging on the way up. When I reached the summit ridge, I turned west and soon saw the flagging again, along with some small cairns and a herd path. Within a couple minutes, I reached a fine ledge just below (and west) of the true summit. Most of my pictures were taken from this spot. There is a 180 degree view to the west that is quite nice. I also went to the true summit but it was nondescript. The ledge was the place to be. On the way down, I followed the orange flagging. It was a herd path that had been marked by someone. It went down the slope just west of the drainage that I had followed on the way up. Near the bottom, it had turned east and crossed the drainage (that is where I first saw it) and it continued east a short distance, then dropped south to the abandoned road. It's a little bit longer than the route I had taken, but it was alright. It came out just near the state land sign pictured below. I came back to this hill on Saturday to show Leesa the view from the ledge. Lots of low clouds on Saturday made for some different pictures so I included some of those here as well. I thought this was a nice little bushwhack hike to a ledge with a great view to the west. Today I wanted to find a hike with views, but I didn't want to get high enough that I would have to deal with soft melting snow. I was worried that it would be hard on my dog if she kept sinking in deep soft snow. 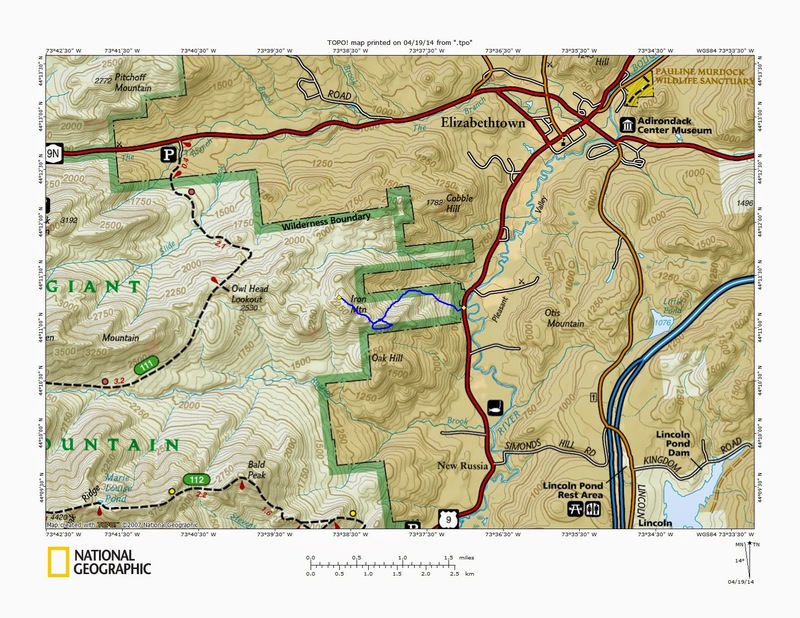 I came up with the thought of climbing Iron Mountain in the Giant Mountain Wilderness from Route 9, just north of New Russia. State land touches the road at that point and there is a pull off on the west side of the road there. I didn't see a state land sign by the pull off, but there was one just to the south and there were no posted signs. I was sure I was in the right spot. There is an old logging road that leads into the woods from that point. I headed SW following the logging road. It quickly turned NW near a waterfall. There was a main trunk road and lots of old side roads. I stayed on the primary road for .9 miles at which time I reached a drainage coming from the col between Iron Mountain and the rock ledge I wanted to visit. At this point I turned SW again following the drainage. The woods were open, and with no leaves on the trees, I could now see that the drainage was indeed leading me right to where I wanted to go. 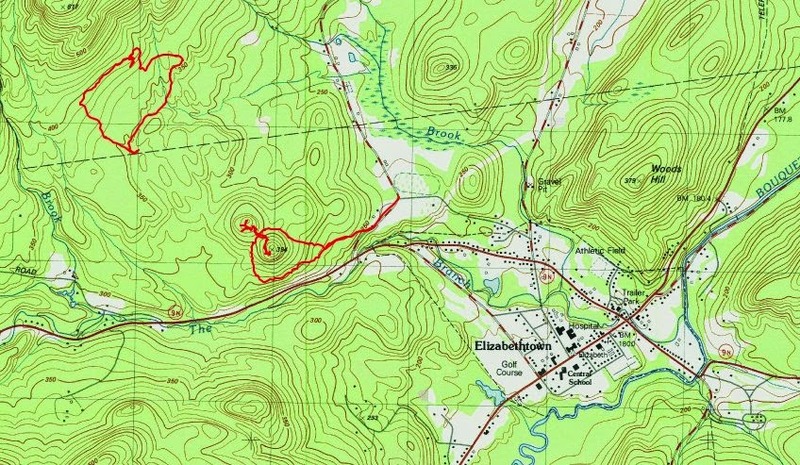 Soon I could see the open rock that is shown on the topo map. The rock was huge! It reminded me of the slab on Hopkins Mountain in Keene Valley. Rev was the first to reach the top. She roamed all around as I took too many pictures. There were great views of Bald, Rocky Peak Ridge, Giant and Green Mountains. On this open summit I find the old survey station bolts that I had heard were at this location. Rev continued to be curious about everything and I took some shots of her. I just kept taking pictures of Giant and RPR. I knew I'd probably delete most of them, but you never know which ones will be the keepers. I left a few here below even though they're somewhat similar. It had only taken one hour to reach the open rock, since it was only 1.5 miles from the car. It took me another hour to reach the true summit (since I was taking so many pictures). Also Rev and I had eaten lunch on the 1st open rock. This really was a nice summit and it felt quite remote even though the hike was short. I could have continued on to Owl Head Lookout, but I had other plans for later in the day. I'll be back to this location for sure. It's a nice place to bring someone that wants a great view without a whole day effort.